"If you want to read about...fascinating can-do business builders by two razor-sharp doers themselves, this is the book. If you want to disprove the ugly myth that 'Canada' and 'entrepreneurial' do not compute in a single sentence, this is also the book. Open it up and get acquainted with a bevy of compelling characters who reveal how they've don it and get their tips on how you can do it, too." "I am neither a businessman an entrepreneur, but this book gave me practical ideas on how to better cope in an industry that, like so many others, is changing at the speed of light. Brody and Raffa chronicle some amazing and inspirational Canadian success stories and in doing so offer valuable lessons on how to harness teamwork, creativity and - above all - passion into any workplace." ...ALL OF WHOM HAPPEN TO BE CANADIAN. Lessons on teamwork from Homer Simpson? World-renowned architect, Moshe Safdie, on organizational design? Joe Boxer, guerilla marketer? How can vision turn a single Toronto motel into the global luxury Four Seasons chain? Isadore Sharp shares his insights. How can anybody sell a multimillion-dollar pharmaceutical company in just one week? Leslie Dan Tells you how he did it. 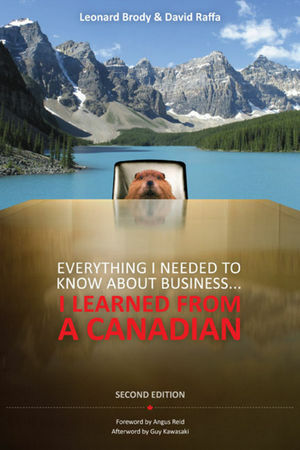 Everything I Needed to Know About Business...I Learned From a Canadian offers first-hand insights, experience, and best practices from twenty-four business and culture leaders, all of whom have achieved excellence in a particular area of business,at home and on the world stage. Some are household names, others are barely known outside their own industry, but they all share the secrets of their amazing success. New to this Second Edition are four brand new chapters on luminaries such as Stewart Butterfield, the mind behind Flickr; and Graydon Carter, Editor-in-Chief of Vanity Fair. With additional mini-profiles of four entrepreneurial up-and comers, this new edition offers more advice and inspiration than ever. Each chapter features "5 Things You Need to Know" - the essential lessons from the leaders and entrepreneurs who have been there and done it all. You'll learn the best of business wisdom, get practical advice on company building, and discover how to prosper in one of the most challenging market environments in history. This book offers management lessons that are as entertaining as they are instructive, all built around the deep thoughts and insights of leaders who are the best in business. The authors are graciously donating all of their profits from the sale of this book in Canada to young Canadian entrepreneurs who are trying to make our world a better place. Leonard is a highly respected entrepreneur, venture capitalist and best-selling author. He has helped in raising millions of dollars for start-up companies, been through one of the largest internet IPOs in history and has been involved in the building, financing and/or sale of five companies to date. Much critical acclaim has followed him in his endeavours. At Onvia (where he was part of the initial executive), the company was voted Canada's number one start-up in 2000 and subsequently closed a $240 million IPO on NASDAQ. becoming one of the largest news agencies in the world, with over 140,000 contributing reporters in 160 countries and 6,000 cities. In the last year, The Guardian in London ranked NowPublic as one of top 5 news sites in the world and Time Magazine named it as one of the top 50 websites of the year. Leonard acts as an advisor to venture capital funds in the US, Europe and Asia and is currently a Senior Advisor to the Canadian Ministry of International Trade, and a Director of Canada's largest technology association, CATA. the Indian Institute of Technology in Mumbai and the Gordon Business School in Johannesburg. He has spoken at conferences throughout the world such as NASSCOM, the World Newspaper Congress, CEBIT and the Monaco Media Forum. His work has been featured in such publications as USAToday, Fortune, the Wall Street Journal, the BBC, El Mundo and Der Spiegel. Leonard holds an Honours Bachelor of Arts from Queens University, a law degree from Osgoode Hall and is a graduate of the Private Equity Course at the Harvard Business School. David Raffa is a recently minted venture capitalist, lapsed attorney and iconoclast. He is a much sought after advisor to emerging technology companies, and is an acknowledged corporate finance expert who has made a career out of advising boards, assisting companies in raising financing, and assisting companies in engineering exits. David has served on more than twenty corporate, industry and charity boards, often as Chairman, including the BC Technology Industry Association and the Science World Equity Committee. He also served as an advisor to the BC Securities Commission and the TSX Venture Exchange. He has been engaged on a number of occasions to lead companies in achieving successful liquidity events. When not buried under business plans or engaged in boardroom negotiations, David devotes his time to his wife and three daughters at his home in Deep Cove, BC, Canada, and occasionally sneaks out with his dog, Chiko, to partake in a little North Shore mountain biking. PART ONE: FIRST PERIOD: LEARNING TO SKATE. Chapter 1: Within These Walls: Place, Harmony and Organizational Design (Moshe Safdie, Architect, Moshe Safdie and Associates). Chapter 2: Strength and Endurance: Family Business and the Napoleonic Art of Victory (Ben Weider, Co-Founder, Health and Fitness). Chapter 3: Bliss Girl: Bootstrapping Rhinestones into Diamonds (Marcia Kilgore, Founder, Bliss Spa). Chapter 4: Success Toolbox: How Mindset and Outlook Can Impact Performance (John Assaraf, Founder, OneCoach). Chapter 5: What’s Next with Debbie Landa, Founder of DealMaker Media. PART TWO: SECOND PERIOD: THE BRAND. Chapter 6: Brand Era: Creating and Delivering the “Big Idea” (Brian Fetherstonhaugh, CEO, OgilvyOne Worldwide). Chapter 7: Pitching Up the Wazoo: Managing Communications in the New Media Millennium (Bonnie Fuller, Editorial Director, American Media, Inc.). Chapter 8: On Underwear and Seduction: The End of Selling in a World That has Everything (Nick Graham, Founder, Joe Boxer). Chapter 9: Your Host: The Complexity of Being Known for One Thing (Isadore Sharpe, Founder, Four Seasons Hotels). Chapter 10: What’s Next with Stewart Butterfield, Founder, Flickr. PART THREE: THIRD PERIOD : THE ELUSIVENESS OF CHANGE AND TIME. Chapter 11: Magnificent Obsession: How the Relentless Pursuit of Vision Can Change the World (Geoffrey Ballard, Founder, Ballard Power Systems). Chapter 12: While the World Was Stacking: Convergence — Success and Exploration in the Second period (Leonard Asper, CEO, CanWest Global Communications). Chapter 13: Moving an Elephant with a Mouse: Changing the Unchangeable (Rob McEwen, Chairman & Founder, Gold Corp). Chapter 14: Speed Thrills: Growth from Zero to a Billion (Craig Dobbin, Founder, CHC). Chapter 15: How to Sell Your Company Without Really Trying — And Do It In One Week (Leslie Dan Chairman and Founder, Novopharm). Chapter 16: Technology Revolution: How the Net Generation Is Changing the World, and Why Businesses Need to Pay Attention (Don Tapscott, Author, Grown Up Digital, Wikinomics). Chapter 17: What’s Next with Garrett Camp, Founder, StumbleUpon. PART FOUR: OVERTIME: VALUES, CULTURE AND WHAT YOU STAND FOR. Chapter 18: Do’h! : Five Lessons Homer Simpson Taught Me about Teamwork (Joel Cohen, Producer, The Simpsons). Chapter 19: Managing the Perfect Storm: Leadership when the Chips Are Down (Paul Tellier, former CEO, CN Rail and Bombardier). Chapter 20: The Grandeur of Simplicity: Have Fun, Make Money and Grow (Jim Pattison, CEO, Jim Pattison Group). Chapter 21: Declaration of Independence: The Value of Values (Terry McBride, CEO, Nettwerk Music Productions). Chapter 22: Teach Them to Fish: The Critical and Timely Rise of Social Entrepreneurship (Jeff Skoll, First employee and President, eBay). Chapter 23: Taking a Stand: The Risk of Speaking Out Graydon Carter, Editor in Chief, Vanity Fair. Chapter 24: What’s next with Craig Kielburger, Founder, Free the Children.